We're very proud of our Website and want you to enjoy it, fully. 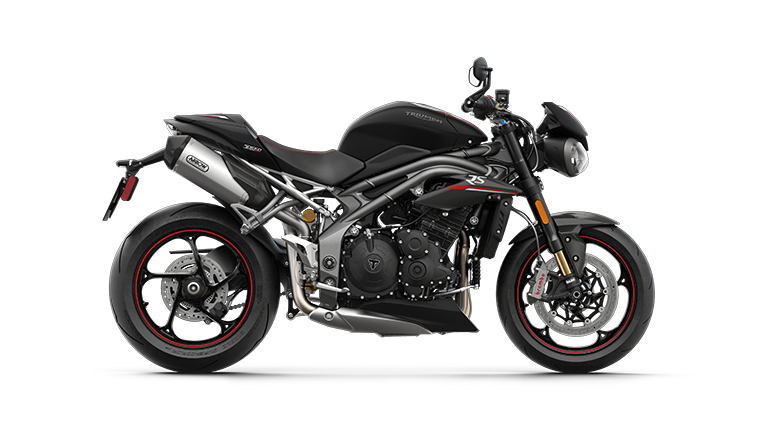 These terms and conditions are for and on behalf of Triumph Motorcycles Limited, whose registered office is at Ashby Road, Measham, Swadlincote, Derbyshire, DE12 7JP, and its Affiliates. For the purpose of these terms and conditions; (a) “Affiliate” shall mean any entity that directly Controls, is Controlled by, or is under common Control with Triumph Motorcycles Limited, and (b) “Control” shall mean the beneficial ownership of more than 50% of the issued share capital of a company or the legal power to direct or cause the direction of the management of the company, and “Controls” and “Controlled” shall be interpreted accordingly. 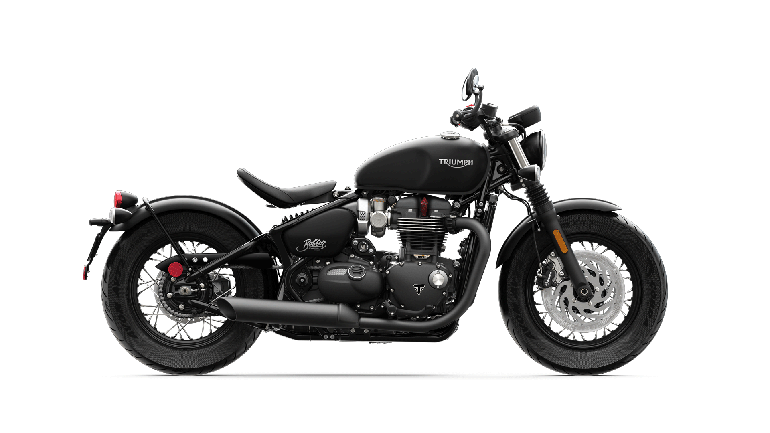 All references in these terms and conditions to Triumph, Triumph Motorcycles, Triumph Motorcycles Limited, and/or to the company (as relevant) shall include Triumph Motorcycles Limited and its Affiliates (as defined above). All textual, graphical and other content appearing on this World Wide Website ("Web Site"), unless otherwise noted, are the property of Triumph Designs Limited, Normandy Way, Hinckley, LE10 3BZ, England. All Rights Reserved. You may view, copy, print and use content contained on this Website solely for your own personal use and provided that: (1) the content available from this Website is used for informational and non-commercial purposes only; (2) no text, graphics or other content available from this Website is modified in any way; and (3) no graphics available from this Website are used, copied or distributed separate from accompanying text. Should any user of this Website send any feedback or data, such as ideas, comments, suggestions or questions regarding any Triumph Motorcycles Limited product or service or the content of this Website, such information shall be deemed to be non-confidential and Triumph Motorcycles Limited shall have no obligation of any kind with respect to such information and shall be free to reproduce, use, disclose and distribute the information to others without limitation. Access to this Website is monitored. The requesting URLs, the machine originating the request and the time of the request are logged for access, statistics and security purposes. Use of this Website constitutes consent to such monitoring. This Website may be unavailable from time to time due to mechanical, telecommunication, software, hardware and third-party failures. 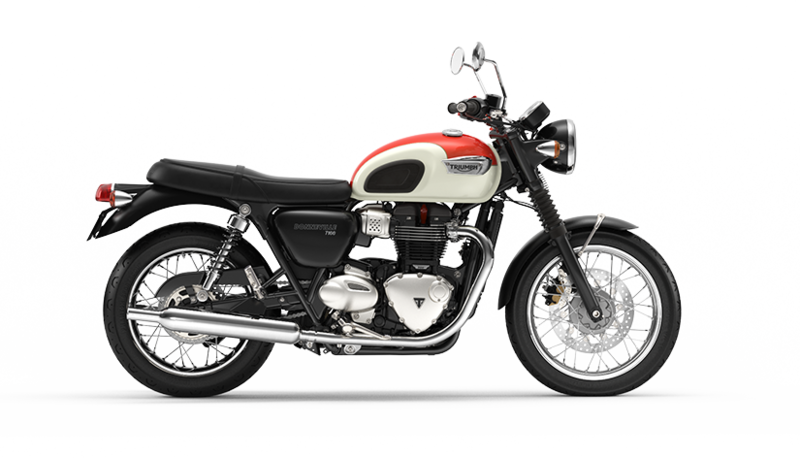 Triumph Motorcycles Limited cannot predict or control when such downtime may occur nor control the duration of such downtime. Reasonable care is taken to ensure the accuracy of information and related materials provided by Triumph Motorcycles Limited on this Website, however, Triumph Motorcycles Limited is not responsible for misprints, out-of-date information, technical or pricing inaccuracies, typographical or other errors appearing on this Website or any other Website. Information and related materials are subject to change without notice. By using this Website, you assume the risk that the information and materials on this Website may be incomplete, inaccurate, out-of-date, or may not meet your needs and requirements. Please note that this Website contains images of Motorbikes that feature accessories and this may or may not be stated. Triumph Motorcycles Limited takes no responsibility for any misunderstanding of standard specification that this may cause. 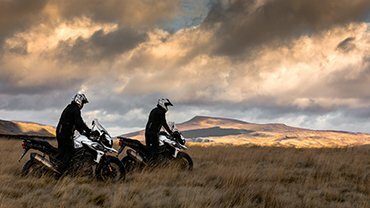 Photography and video used within this Website shows Triumph motorcycles being used by expert professional riders in protective gear under professionally controlled, closed course conditions. Triumph does not endorse or encourage stunts, tricks or any form of irresponsible riding. 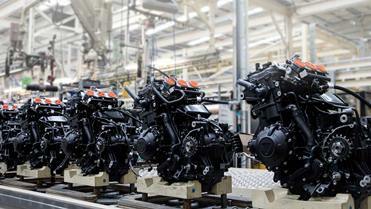 The Motorcycles shown in our videos are street legal motorcycles with light off road capability. Light of road use includes use on unpaved, dirt or gravel roads, but does not include riding on motocross course, any off road competition or riding off road with pillion. 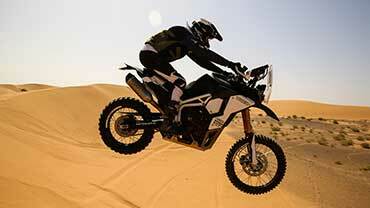 Light off road use does not include jumping the motorcycles or riding over obstacles. Do not attempt to jump over any bumps or obstacles. Do not attempt to ride over any obstacles. 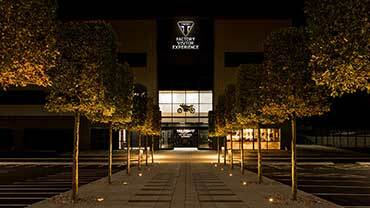 At Triumph we want every ride to be safe and enjoyable. Always ride safely, defensively and within the limits of the law. Always ride within your ability, take riding skills courses and wear protective gear. Never ride under the influence of alcohol or drugs. 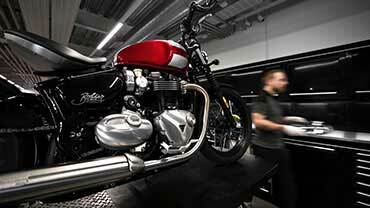 Study your owner's manual and inspect your Triumph before riding. 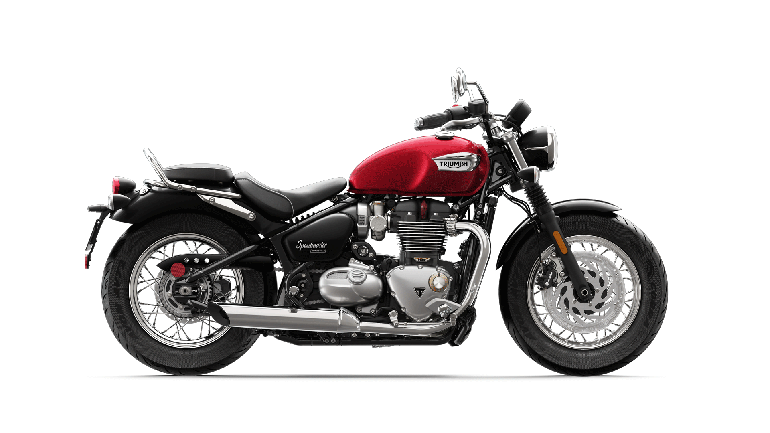 Triumph Motorcycles Limited specifically disclaims all warranties express or implied, including without limitation the warranties or merchantability, fitness for a particular purpose and non-infringement with respect to this Website and information, graphics and materials contained herein. 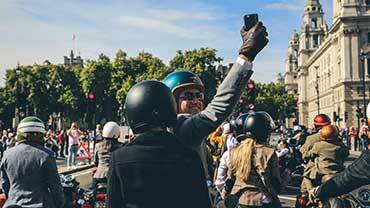 Under no circumstances will Triumph Motorcycles Limited be liable for damages of any kind, including without limitation any special, indirect, incidental or consequential damages. All information on this Website relates to the UK market. It may be accessed by users internationally but users must note that some products, programmes and services may not be available in your country due to market, technical or legislative constraints. 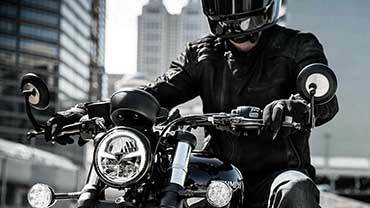 Triumph Motorcycles Limited reserves the right without prior notice to discontinue models, parts, accessories, clothing and other items or change specifications at any time without incurring any obligations. 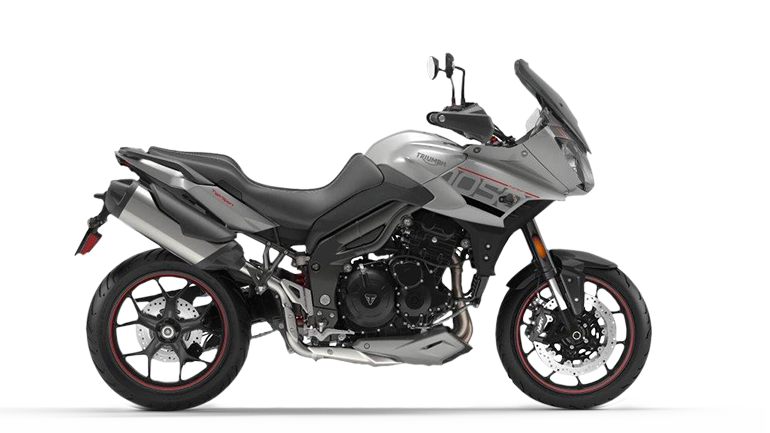 Motorcycle and accessory specifications may vary from country to country. Note that many countries prohibit the importation, registration and/or use of vehicles and accessories not built originally to meet that country's specification. 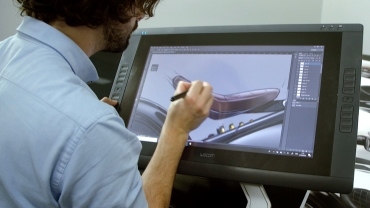 Consult your dealer for model, accessories and clothing availability. 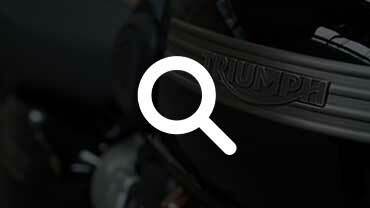 Triumph Motorcycles Limited recommends only the use of Triumph Genuine Parts and Accessories on Triumph Motorcycles and these should be fitted only by an authorised Triumph Motorcycles dealer. 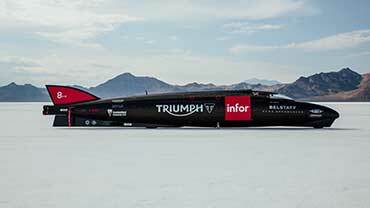 Triumph does not accept any liability whatsoever for defects caused by the fitting of non-approved parts, accessories or conversions, or by the fitting of any approved parts, accessories or conversions by non-approved personnel. 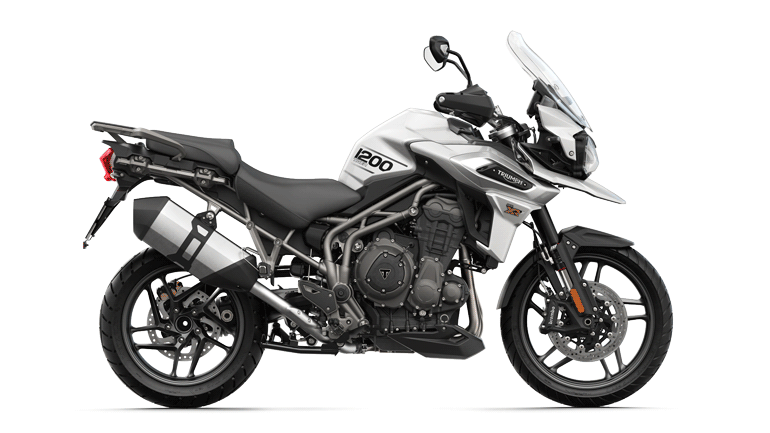 The fitting of non-approved parts, accessories or conversions, or the fitting of approved parts, accessories or conversions by a dealer who is not an authorised Triumph dealer, may affect the handling, stability or other aspects of the motorcycle's operation, which may result in an accident causing serious injury or death. In particular, it is extremely hazardous to fit or replace parts or accessories whose fitting requires the dismantling of or addition to either the electrical or fuel systems. 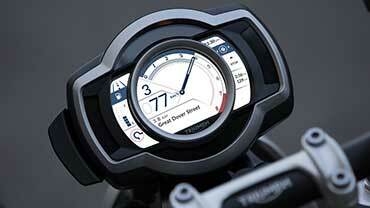 At Triumph we want every ride to be safe and enjoyable. Be sure to ride safely, defensively and within the limits of the law and your own riding abilities. Take a riding skills course. Always wear an approved helmet, eye protection and appropriate protective clothing and always insist that any passenger does the same. Never ride while under the influence of alcohol or drugs.